Whiskey In A Snipe Glass: Two musky day? A little over five years ago I caught a musky on a fly. I know that because after I penned a summary of the day's grouse hunt into my journal I started reading back on some of the past entries. It wasn't the first musky I'd ever caught but it was the first on a fly, and it took a fly that I'd tied myself. Thanks to that journal I was able to recall the day and if that sort of thing seems like it could be important, then you can see the value of a journal. Up until then I'd been pretty happy casting size 4 and 6 poppers to smallmouth bass on a six-weight rod. The rest of my fly fishing consisted of a lighter rod and the usual trout flies, or at least my rendition of them with what materials I could scrounge up: feathers from game birds I'd killed and the neighbors chickens, fur from locally trapped animals. For a long time any deer hair I used came from a taxidermist friend. It was all natural and I couldn't see paying for deer hair when I could get it free, and who cared about color? I still don't know much, but I've learned a lot about deer hair since then. We were on that river recently. 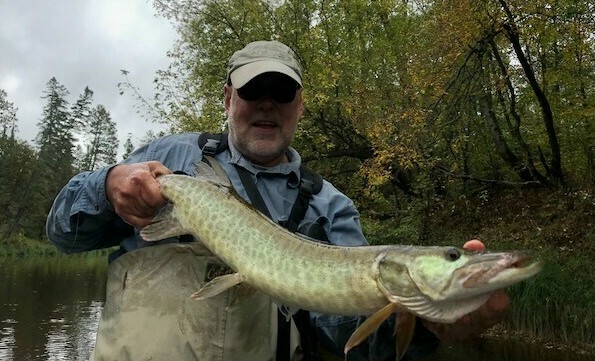 Fall time – probably the best time for muskies. You take a day off from grouse hunting and give the dogs a rest. The shotgun is benched and the big rod is pulled out again. 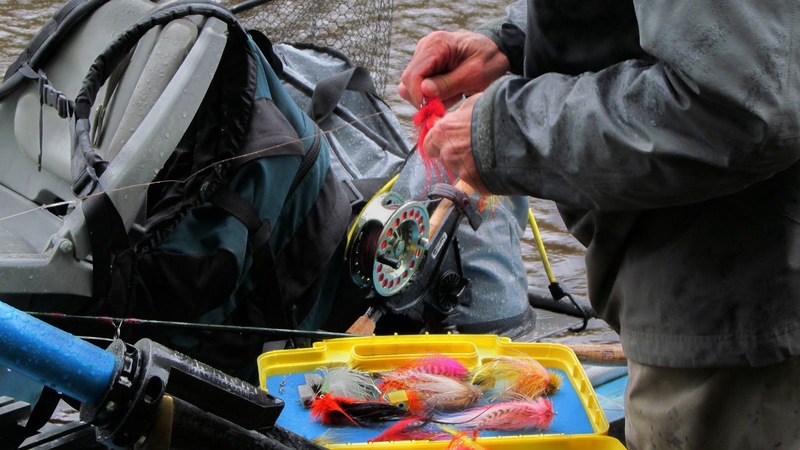 The ten-weight sink tip line ends with a 30 pound (or maybe 40) leader, a foot or so of wire and a heavy duty snap. A fistful of hair and feathers that's tied to a hook resembling something you'd hang your coat on, only much sharper, is twisted onto that snap. Put on some waders 'cause you might have to jump outta' the boat to land a fish. Then you're ready. The fish was prowling off the left bank, ready to eat. 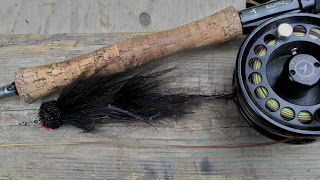 It might have heard the fly hit the water and perhaps the vibration caused by the hefty deer hair attracted it. 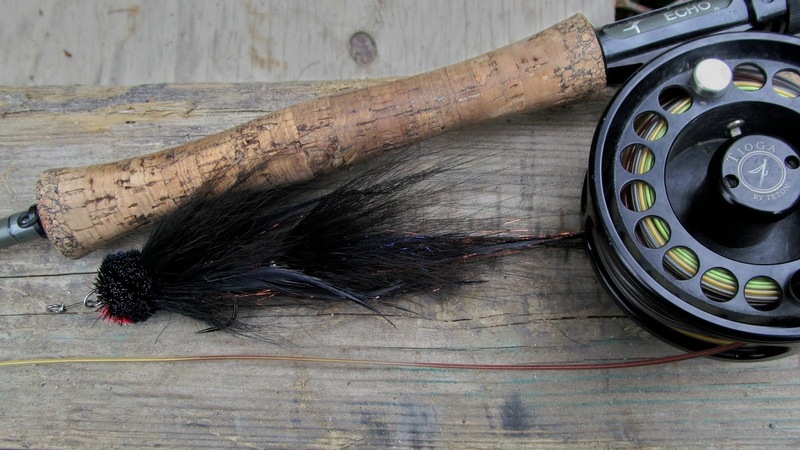 Maybe it was the way the bucktail kicked as the fly was stripped through the water and maybe the color had something to do with it. At any rate the musky turned to it just under the the surface. By now we all know to point the rod at the fish and strip-set hard when a musky hits. Sometimes I remember to do it right and an exciting battle is on. Scotty pulled oars to get us into mid-river away from submerged cover and obstructions while I enjoyed the happy pleasure of a rod bending strong fish. A couple times the musky was close but upon seeing net it took off on another line stealing run. You don't land a musky all that often and it easy to get over eager, but when the time was right Scott scooped the fish and I had another musky in my hands. It wasn't a monster, but any fish as long as your leg is something to see. That's about when the rain started and the temperature dropped. We took turns at the oars and talked through a number of topics waiting for a strike. 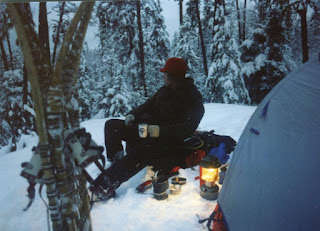 A couple of small pike hooked themselves with their slashing attacks but the exhilaration was short lived and cold rain had us wishing for another layer of clothes and thinking about a warm fire and glass of whiskey. Scott asked how many muskies I'd caught on my best day. It was a year ago that we floated this very stretch and Scott hooked and landed two nice fish. One musky makes for a good day, two is really good, and plenty of trips end with none. I've had action with more than one before, but I've never landed more than one in a day. Then it hit! Another musky on! I pulled him from the bank and fought him long enough for Scott to say I was going to have a two musky day. Out in the middle of the river Mr. Musky was up and twisting like a snake on a stick before it cleared the water and left me holding a limp line. I'm convinced these muskies clamp down on a big fly and just hold on. You strip hard to slide the hook into their jaw but sometimes you're just tugging the fish like playing tug-of-war with a big dog. Just when you're thinking what a great photo it will make the fish merely opens it's mouth and pretty much spits the fly out. It's happened to me a lot. Muskies are mean that way.